These trees only have a few years left to live unless they get help. These Trees Need Your Help! This sword fern battles for its life. East and West Waluga Parks are under attack and need your help! English Ivy is creeping up most of the park’s majestic trees and without help, many of them will die. 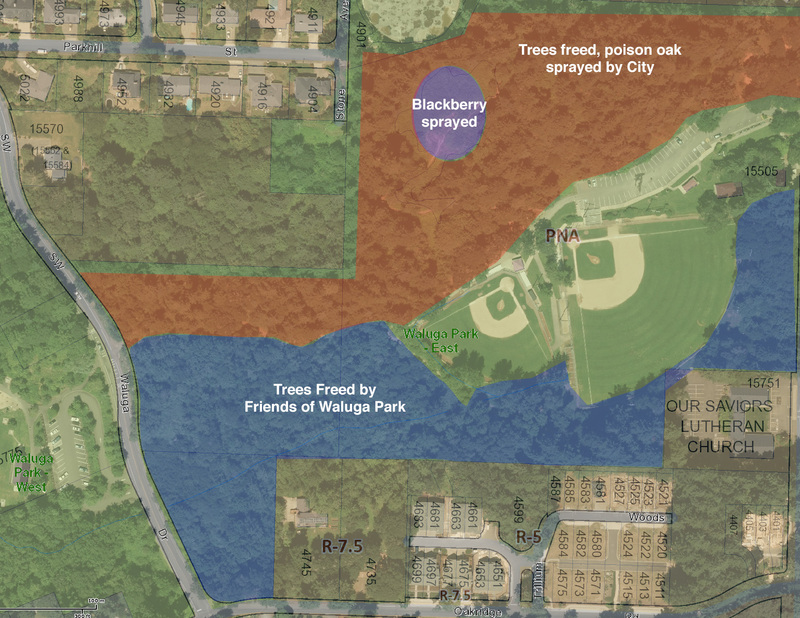 The Waluga Neighborhood Association (WNA) has formed “Friends of Waluga Park” in an attempt to preserve the park’s trees. The City of Lake Oswego has hired crews to treat the invasive species such as ivy, blackberry and poison oak, but they cannot commit to a timeframe to complete the park due to funding uncertainties. In light of this, Friends of Waluga Park is sponsoring work parties to “Free the Trees” until the park can be treated. WNA is a firm believer in the importance of this wonderful park to our neighborhood. It provides a place for our children to play and an oasis of natural beauty within walking distance. Additionally, a healthy and beautiful park benefits us all by elevating our property values. Please consider helping out at the “Free the Trees” work parties. The trees we save will live far longer than we will; our work will be a enduring gift to future generations.